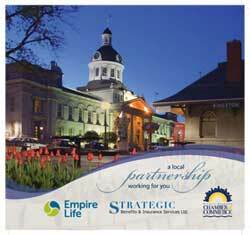 Kingston Chamber Group Benefits | Strategic Benefits & Insurance Services Ltd. This plan is a unique partnership between the Greater Kingston Chamber of Commerce, Empire Life and Strategic Benefits and Insurance Services Ltd.
As a member of the Kingston Chamber of Commerce you will have the security of knowing that a comprehensive employee benefit plan can be personalized for you and your employees. These employee benefit plans include: Life Insurance, Accidental Death & Dismemberment, Income Replacement, Health Spending Accounts, Health Insurance and Dental Insurance. Let the GKCC help tailor a plan to your budget and needs, to help attract and retain the high caliber employees you need to make your business successful! Why do you Need Plans?